When it comes to Florida landscape color, orange crushes it. Orange is one of those “look at me” colors that can sculpt a landscape in a deliberate way. You can use it to frame a seating area, cozy up a large space or draw guests to your grilling area (orange stimulates the appetite, too). As a warm and energetic color, orange moves the eye forward but can be overpowering, so watch out for orange overload. Here are five oranges ArtisTree has a crush on, ranging from sizzling to staple specimens we promise won’t disappoint. Orange Geiger Tree: If you’re looking for a stunning coastal tree that’s salt- and drought-tolerant, the Orange Geiger is a brilliant choice. Bright crinkly blossoms appear year round but especially in spring and summer. We like a simple strong trunk vs. multi-trunk specimens. Frothy frills come in yellow and white, but hummingbirds prefer tasty orange. Geigers thrive in sandy, alkaline soil but hate the cold (we prefer not to spec them inland). These evergreen sun lovers will grow to 25 feet and grace you with a showy, 20-foot-wide canopy. 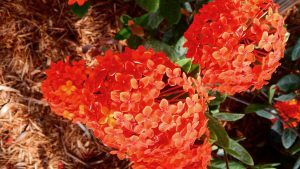 Ixora: A few years ago the ubiquitous ixora fell a bit out of favor because it was viewed as old-fashioned. (Seriously?) But this dependable, nearly year-round bloomer remains an old-school-cool choice for both informal and manicured landscapes. 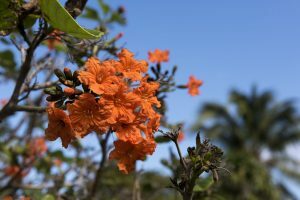 Two of our zestiest favorites are Maui and Prince of Orange – both lush flowering shrubs that are moderately drought- and salt-tolerant. They don’t mind partial shade but produce more clusters when the sun’s shining down on their dark, leathery leaves. Easy care with a punchy attitude, ixora is something you’ll want more of. Bulbine: We love these tiny dancers with their polka dots of orange twirling on two-foot stalks. 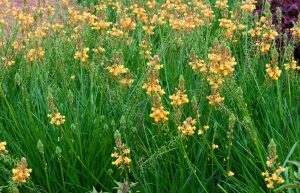 Not until 2006, when it was named plant of the year by the Florida Nursery Growers and Landscape Association, did bulbine gain its well-deserved place in the sunlight. This drought-tolerant perennial with yellow stamens will bloom repeatedly for you as a mass planting, rock garden accent or even as a jolt of color in your herb garden. Take care not to overwater, and ready yourself for butterflies and hummingbirds that also love Florida landscape color! 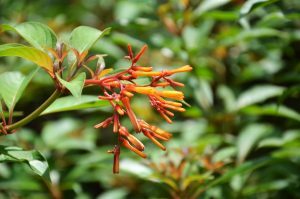 Firebush: If you like a soft, natural look, this South Florida native is a sure-fire way to light up a landscape. Its organic form (we cringe when we see it sheared tight) makes it a great selection for a casual hedge or privacy screen. Tubular reddish-orange flowers bloom all the way up to 15 feet but can be pruned to your space – against high fences, window walls or around patios. True to its name, the indestructible firebush can take the heat; it’s drought/salt-tolerant and disease-resistant, too. Give it full sun and well-drained soil, and it’ll give you back a bud load of Florida landscape color. 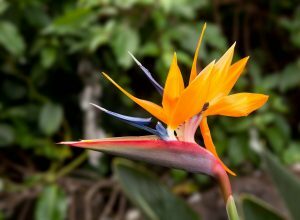 Bird of Paradise: No wonder Florida residents can’t get enough of this exotic specimen. Striking orange and blue “plumage” makes it look like a bird in flight; in fact, its nickname is the crane plant. Although it grows in full sun, it likes a little shade and well-drained soil. Orange birds expect you to feed them with a good granular fertilizer and regular irrigation, but other than that, there’s not much to do except remove brown leaves and stems. ArtisTree likes BOPs best when used as a dramatic focal point or tropical accent. By the way, these birds will come through for you with flying colors when planted in containers, too. To see ArtisTree Landscape’s orange color story in Sarasota Magazine, click here. Dreaming of a renovation brimming with Florida landscape color? Choose the landscaper that luxury builders use by calling Jenni Lassen at 941.488.8897. Or visit artistree.com. A big thank you to you and your team for making our community look so awesome. I drove around this morning and just wanted you to know we see the difference you are making. Please keep up the great work!